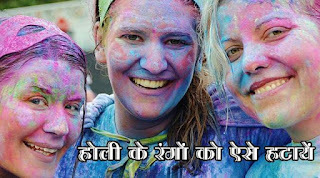 While Holi is an extremely joyous and playful festival, the colour that is used is dangerous to your skin and if not properly treated can prove harmful in the longer term. With the occasion approaching, here are a few tips to freeing your body of artificial colours after playing Holi. For your hair, applying egg yolk or curd and leaving it for about 45 minutes before using a mild shampoo is also an effective method to rid your hair of holi colour and its damaging chemicals. The following day, 2 teaspoons fenugreek seeds, shikakai powder 3 cups - water, and amla powder should be used to make a boiled mixture with which you can shampoo your hair. Post this procedure, apply henna to your hair. Make a paste of besan with milk or yoghurt, sweet oil, and rose water, and apply it on your skin. After five minutes, rinse your face gently with a delicate soap and water. Using coconut oil on the face before soap also aids in removing the colour, as does the rubbing of lemon wedges on the skin with oil and wheat flour mixture. Use soaked amchur powder and avoid excessively washing your face as this can lead to drying and irritation. Ubtan is also helpful for this, along with hour-long pre-soaked Multhani Mitti. When the pack dries, rinse it off to remove the colour. To nullify itchiness, use a combination of glycerine with rose water on your face and rinse it with warmer water. A cleanser that has lemon and aloe vera in it is also highly potent to remove colour. Even Cetaphil cleansers and antiseptic cream application are capable of this. Avoid getting a bleach or facial for at least a week so that your skin can normally obtain balance. Play safe and play smart every Holi so that your loved ones don’t get red in the face and stay that way. Don’t be green with envy or blue with sickness, follow these tips and smile happily all through this colourful traditional festival.